On her first day of class at the New York Film Academy Professional Conservatory of Musical Theatre, Alexia Sielo didn’t know exactly what to expect. She anticipated a life alternating experience as she aimed to someday rest her heart and dreams on a Broadway stage. Even though, role models were limited, there were theatre performers who paved a way for Alexia and the next generation of Broadway babies of color. In her new concert Women Of Color On Broadway, Alexia (who performed one of our favorite versions of "I'm Here") takes audiences on a journey through the history of Broadway to honor African American, Latin and Asian females who paved the way for future generations of women of color in musical theatre. Proceeds and post-concert donations from the one-night-only event (June 29 at Don't Tell Mama) will benefit Broadway Cares/Equity Fights AIDS. 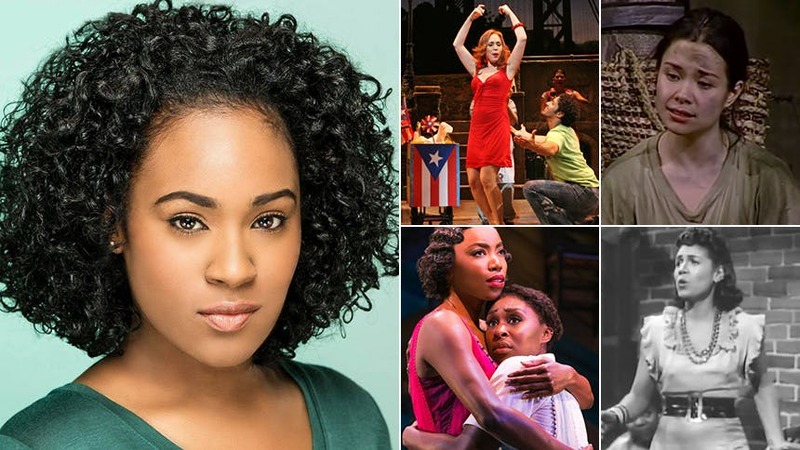 In celebration of her show, Alexia shares the top 10 performances (not in any order) by women of color on Broadway that molded her identity as an artist. I grew up in the church. Watching Cynthia, Danielle, Heather Headley, and the rest of the women singing together reminded me of the when my mother used to sing with her sisters during church service. Despite the unfortunate events Celie experienced throughout the story, an element of soul and spirituality brought by all women on that stage completely moved me the night I saw them live and during this performance. The first time I heard Lea Salonga’s voice was in the Disney movies Mulan and Aladdin. Before then, she starred in Miss Saigon at only 18 years old. There aren’t many roles made for Asian women in the theatre community. The fact she chose to challenge that at such a young age is so inspiring. From Disney to Broadway, she’s always had wonderful vocal technique, and never missed a beat when it comes to telling the story. You’re never too young to make a difference. Her performance and contribution is simply amazing! Aida was the first play I saw, and I’ve been in love with musical theatre ever since. Heather Headley was one of the first artists who inspired me to pursue this craft. It was the first time I saw someone actually on full Broadway stage who looked like she was splashed with a bit of color. Also, her voice….her beauty…….her poise, are things that are unmatched. She will always be one of my biggest inspirations. That tone! Ok, so technically, this isn’t a “Broadway performance.” However, this is a rendition from the Broadway classic The Wiz, which I think still counts. ;) Uzo EMBODIED her role as the good witch in NBC’s production of The Wiz Live! It was so beautiful to see her tap back into her theatre roots after her success as Crazy Eyes on OITNB. Nothing like a beautiful voice that tells me to keep believing in myself. She definitely encourages me to just go for it! Opera was my introduction to music. Imagine 6 year old me watching The Mo Tenors, and Porgy & Bess on VCR with my father who was a member of Opera Ebony, the oldest African-American opera company in America. It might seem like a peculiar way to torture a ‘90s baby, but for me, Porgy and Bess was the first time I saw anyone who looked like me doing something besides recording records. When the general public thinks of West Side Story, they think of the film adaptation starring Rita Moreno (someone I admire as well). But, we cannot forget the one and only Chita Rivera—Singer! Actress! Dancing Extraordinaire! She is a pure entertainer. As someone who lives in her #LatinGirlMagic every day, I appreciate what she represented at the time. And as a girl who also embraces my #LatinGirlMagic and #BlackGirlMagic, she is someone I definitely look up to. If there’s one Broadway performance everyone knows, it’s Jennifer Holliday’s “And I Am Telling You”, and rightfully so. Talk about soul! The Dreamgirls soundtrack was always on repeat in my house when I was growing up. While I never saw the musical (I wasn’t born yet), putting a face to the music was inevitable and essential! Jennifer’s Holiday is iconic and this is the performance everyone should take note when delivering their 11 o’clock number. The Wiz was the first musical I ever did…..I was Dorothy. To prepare for the role, I got on the computer to do some research (every new theatre student needs to be taught the value in character research), and bumped into this video. Stephanie Mills was one of the first to bring church to Broadway! Seeing Stephanie, Ted Ross and Mabel King and the others on stage together must have been must have been just magical. I wish I was alive so I could have witness it “live” back in the day. Everyone knows Deidre Goodwin. If you don’t, you should. Not only a fabulous dancer, she’s an outstanding teacher and an even better mentor. I had the pleasure of studying with her during my years at NYFA. Of course, I’m gonna include her performance of “At the Ballet” from her Broadway run in A Chorus Line on my Top 10 List. The passion and beauty she brings on stage is just exceptional. This is probably my favorite ensemble performance ever, and it’s even better to see the women taking the lead. I grew up in Northern New Jersey where everyone is “Chile-Domini-Curican”. Somehow, my closest friends and I always shared Latin background. You could be dancing to Celia Cruz or Cesaria Evora, but waving your home flags. It didn’t matter because in our neighborhood, everyone’s flag represented the same thing-PRIDE. See Alexia Sielo in “Women Of Color On Broadway" at Don't Tell Mama on Friday June 29.